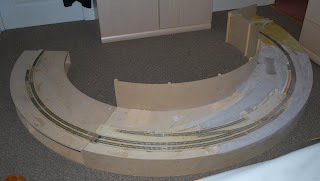 Having fallen off the railway modelling map for some six months, I am now managing to get some modelling done. Our business purchased a second outlet in July and needless to say, this has taken up much of my time! Anyway, back to more interesting stuff. The priority is to get the layout fully functioning by EXPO 2010 (you haven't forgotten about that, have you?). The second and third boards needed wiring and a bit of trackwork completing. To ease myself gently back in, I started with the third board which only has two points forming a crossover. After a few teething problems (mainly me not reading the Tortoise instructions; the switching contacts aren't Left/Common/Right as I'd assumed, but Left/Right/Common), everything seems to work well on here. The temporary loose wires will be replaced by plugs and sockets at each board joint.